Save the space in your inventory by installing the Compression mod, everything is very easy and understandable. This modification adds to MCPE the ability to compress single-type blocks into one, thereby freeing up 8 other slots. This works like a compression machine that reduces and then combines the blocks into one. The compressed block has the same dimensions as the conventional one except for the appearance. The texture of the block makes it clear how many blocks are inside, which means that you can easily distinguish a large compressed block from a small one. But what to do then with these blocks? Compressed blocks can be turned back in one motion. Just imagine how many slots will be clean if you compress 9 stones stacks for example. 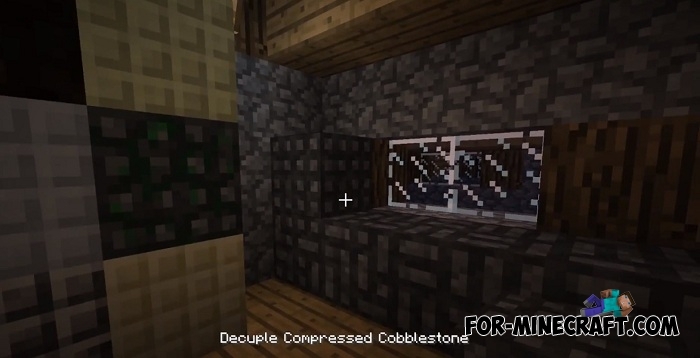 The original name is Additional Compression and its ported version works great on Minecraft Bedrock Edition. 1. Download InnerCore the latest version. 2. Move the "Compression.icmod" folder here: games / com.mojang / mods.